This is the story of a girl…..and a potential but probably not psychopath. Nixon has always questioned himself about if he is a psychopath or not. Nix knows he has feelings and emotions, but this is a question that he bounces around a lot in his head. His mother is absent, and he has 3 brothers who are all so different he wonders if this is truly his family. 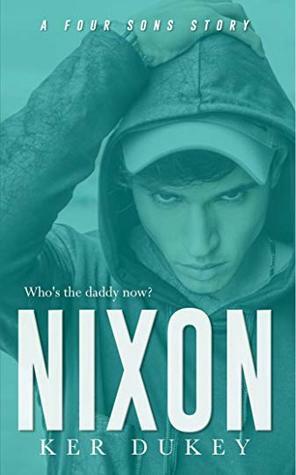 When his father gets into a relationship with Rowen who is 18 and a very vital part of Nixs life he really starts to contemplate the ways he would love to make him pay. Rowen has been part of the family for what seems like her whole life. Having grown up next to the boys she has something for each of them. Hayden broke her heart, Brock hardly had a chance before it began, Nix was her best friend and Cam was like her very own baby brother. When she finds herself enamored with Eric she upsets the balance in their life. Her father is livid and lashes out. Seems that Eric and Jaxon have a sorrid past. She is now finding herself starting over and trying to find her place in this new life she has created. Ok I will admit I have never read the four fathers series and I was unaware that I should have. I now need those books!! 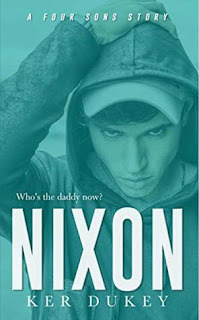 I loved Nixon and how he questioned his morals but in the end everything he did was for love. Hayden you are a major jerk, but I can’t wait to find out your motives. This book has it all. Some skeevy people and some karma is a witch moment. Only a few times I felt things were kind of disjointed or just oddly tossed in to make the story more dramatic. All in all I did enjoy this story and can’t wait to find out about the other brothers in this series.I love the mind that is Ker Dukey.